CD 20 page booklet & uncoated slipcase. 20 page booklet with extensive liner notes and interviews with Victor Uwaifo plus rare photos and cover art. Limited Double Gatefold Vinyl release. Since 2002, Soundway Records has been synonymous with high-quality and groundbreaking compilations of music from Africa, the Caribbean and South America. 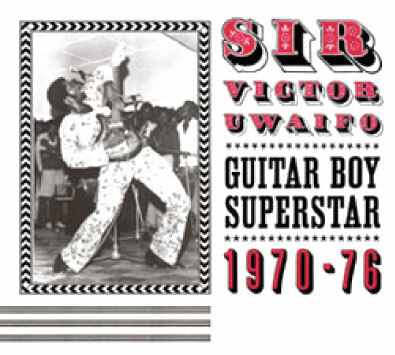 Guitar-Boy Superstar is the first survey of the long career of the legendary Nigerian musician, artist and poet Victor Uwaifo, one of Nigeria's greatest stars - a long-overdue release that puts Victor Uwaifo next to other Nigerian greats better known in the West. Victor Uwaifo's mission to spread and preserve the cultural heritage of ancient Benin (Modern day Edo State, Nigeria) has seen him work as a commissioner for cultural affairs in his native Edo State, a University lecturer, acclaimed bronze sculptor and poet as well as a highly successful musician. He has been awarded Nigeria's highest cultural tribute - the order of the Niger, and continues to teach and work today with an energy that has not abated for nearly fifty years. Cutting his musical teeth with Victor Olaiya ('The evil genius of Highlife') in the early 60s, he went on to form his own band - The Melody Maestros, producing Nigeria's biggest ever selling record with Joromi in 1965,for which he was awarded Africa's first Gold disc. He has continued to produce some of the most popular and engaged music in Nigeria ever since. This album focuses on his early 1970s musical output. Uwaifo invented a unique style of highlife music that he called 'Ekassa' - based on ancient rhythms and fused with modern Highlife instrumentation and just a dash of rock and soul.